Wireless internet in Russia is spreading at lightning speed, with nearly every new notebook computer, mobile telephone and PDA coming equipped with the necessary technology. Wi-Fi hotspots are popping up in major cities, and some 40 million Russians have regular internet access. Yet as Fontanka.ru online newspaper reports on April 14th, officials of Russia’s media and communications agency believe that every wireless user must obtain permission and register their Wi-Fi devices before they can go online. The agency, Rossvyazokhrankultura (short for the Russian Mass Media, Communications and Cultural Protection Service), believes that it can lawfully confiscate wireless devices from anyone violating this directive. Vladimir Karpov, the deputy director of the agency’s communications monitoring division, told the newspaper that wireless internet users must obtain permission to use the radio frequency involved in Wi-Fi transmitting, and must register any electronics that use Wi-Fi technology. Wifi hotspots, personal home networks, and even laptop computers, smart-phones and Wi-Fi enabled PDAs would be affected. Most countries currently allow free and open access to Wi-Fi networking, without any mandatory licenses or limits. Local authorities generally put limits on the maximum signal strength of the transmitters, thereby setting a maximum broadcast range. Loose agreement on spectrum licensing has allowed wireless technology to become one of the most standardized services in the world (Unlike, for instance, mobile telephones, which use different types of networks in different countries). Up until now, the technology has had tacit acceptance in Russia, with the government taking steps to legalize a slice of the radio band specifically for free Wi-Fi. In 2004, the State panel for Radio Frequencies gave indoor wireless networks open rights to a narrow band of spectrum. And in July 2007, the Government of Russia excluded mobile wireless devices from the list of electronics requiring registration. Yet Rossvyazokhrankultura seems to have its own opinion on the matter, and the question of jurisdiction may make the situation all the more confusing. The agency was formed from a 2007 merger of two distinct regulatory bodies (Rosokhrankultura, which oversaw media and Rossvyaznadvor, which oversaw telecommunications). It now appears interested in strictly licensing each and every wireless transmitter and device. According to Karpov’s statement, registering a PDA or telephone would take 10 days. Then, only the owner of the device would be licensed to use it. Registering a Wi-Fi hotspot, on the other hand, would be more difficult. Anyone wishing to set up as much as a personal home-network would need to file a complete set of documents, as well as technological certifications. Networks in Moscow or St. Petersburg would also need approval from the Federal Security Guard Service (FSO) and the Federal Security Service (FSB). Wi-Fi technology (short for Wireless Fidelity), comes built-in in nearly every new laptop computer, PDA, and mobile telephone, and allows for the easy set up of a local internet network without the need to install a mass of cables. The access point, or hot-spot, can be set up anywhere, and every computer store sells special Wi-Fi transmitters called routers. The typical router has an indoor range of around 150 feet, but can reach up to 300 feet if located outdoors. 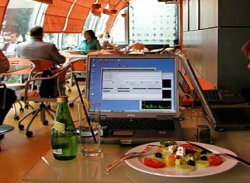 Hotspots, both free and paid are located around the world, in places like hotels, airports, cafes, and parks. There is even an international organization called the Wi-Fi Alliance, which oversees the standard implementation of global wireless technology. After this issue flew around the Russian internet and much of the world, Fontanka.ru issued a follow-up to its original article (RUS). Rossvyazokhrankultura has now denied that wi-fi devices will need to be registered. Wi-fi providers (hot-spots) that charge for the service will need a license, but free networks under a certain range will be exempted. However, the registration agency did not answer many of the newspaper’s questions, and the editors believe that vagaries remain within the wi-fi regulations. Read a full assessment of wi-fi requirements from lenta.ru (RUS).